The dry letalis rigid polypide of four to five instar larvae infected by Batrytis bassiana of Bombyx mori Lof and the dry letalis rigid polypide of inoculated Batrytis bassiana of Beauveria bassana (Bals.) Vuillant of family Bombycidae. Zhejiang, Jiangsu and Sichuan and so on sericulture provinces in China. Collected in spring or autumn. Slight fishy smell, slightly salty taste. Straight, fat, solid, white and with light cross-section. Collected the letalis polypides, mixed thoroughly with lime, blotted water, dried in the sun or oven drying; unprocessed or stir-baked. Salty, pungent, neutral; liver and lung meridians entered. Extinguish wind and stop spasm, dispel wind and alleviate pain, resolve phlegm and dissipate accumulation. It is good at treating infantile convulsions, epilepsy with phlegm-heat because it can extinguish liver wind, stop spasm and resolve phlegm. For acute infantile convulsions, high fever, spasm due to heat-phlegm, it is often combined with heat-clearing and phlegm-eliminating herbs and wind-extinguishing and convulsions-relieving herbs. For instance, it is combined with Niu Huang, Dan Nan Xing and Quan Xie and so on. For infantile chronic diarrhea, chronic convulsions due to spleen deficiency, it is often combined with qi-nourishing and spleen-invigorating herbs and wind-extinguishing and convulsion-relieving herbs. For instance, it is combined with Dang Shen, Bai Zhu and Tian Ma and so on. For epilepsy due to phlegm-heat congestion, it is often combined with phlegm-resolving and wind-extinguishing herbs. For instance, it is combined with Tian Zhu Huang and Dan Nan Xing and so on. For wry eye and mouth due to wind attack on meridians, with its pungent flavor and actions of dispelling wind and unblocking collateral, it is combined with Quan Xie and Bai Fu Zi in Qian Zheng San. Being pungent and lung meridian entered in property, it has actions of dispelling exogenous wind and dispersing wind-heat for alleviating pain, improving vision, relieving sore throat and relieving itching. For headache, blood-shot eyes with swelling and pain, tearing against wind due to up-attacking of wind-heat, it is often combined with wind-dispersing and heat-clearing herbs. For instance, it is combined with Sang Ye, Jing Jie and Mu Zei and so on. For swelling and pain in the throat, hoarse voice due to up-attacking of wind-heat, it is often combined with wind-heat dispersing, sore throat-relieving and pain-stopping herbs. For instance, it is combined with Jie Geng, Bo He and Jing Jie and so on. For itching of rubella, it is indicated singly in powder or combined with herbs to dispel wind and relieve itching. For instance, it is combined with Chan Tui and Bo He and so on. 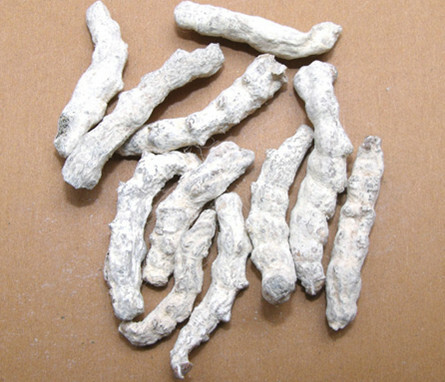 Being salty in flavor and with combining action of resolving phlegm, it can soften hardness and dissipate nodulation. 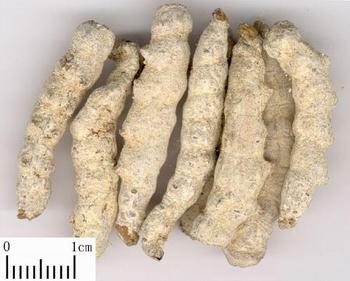 For phlegm nodule and scrofula, it is indicated singly in powder or combined with heat-clearing, phlegm-resolving and nodulation-dissipating herbs. For instance, it is combined with Zhe Bei Mu, Xia Ku Cao and Xuan Shen and so on. Decoct 3~10 g. Take powder 1~1.5 g. Use unprocessed for dispersing wind-heat, other stir-baked.